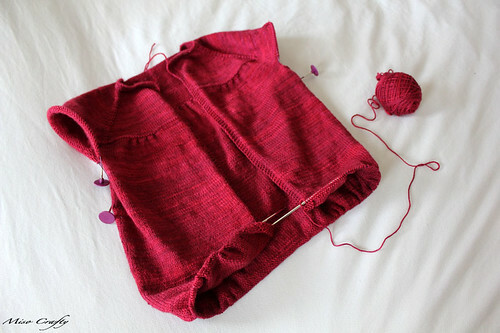 I may feel like a hamster running on a wheel with this project, but slowly and surely it is starting to (finally) look like a cardigan!! I'm sure this would knit up faster if I wasn't taking such huge breaks from it to knit other things. But alas, that's my MO when it comes to knitting cardigans/sweaters...I get impatient at how slow it's becoming an FO and quickly switch to a smaller project for that instant gratification. I'm pretty sure a lot of knitters are like that. Yeah? whadda ya mean "too pretty for socks"? the MCN is soooo nice for socks - I love mine, and red socks would be great! I agree with Natalie! So busted! Thanks for the compliments!! Unfortunately I do not have an etsy shop. :( Sorry! For some reason I can't justify MCN for socks...just too luxurious that putting it on my feet and risking getting holes in the knitting freaks me out too much! I'm thinking a shawl now....less chances of holes and would feel great around the neck! See my response to Natalie!